Now that the holiday shopping season is over, I feel it's a good time to reflect on the past few weeks. They've been busy to say the least. 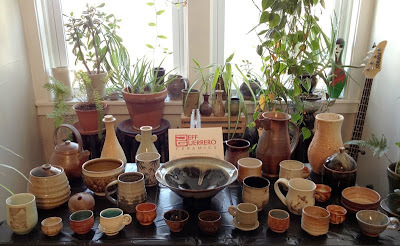 The main event was the Highland Park Pottery Tour, where I opened my home to the public. In many ways it felt like a huge step in becoming a part of the global ceramics community. Several times in the past few weeks while I prepared for the sale, I imagined potters throughout the ages preparing their homes for such sales. I felt a kinship with these people, and realized how it's as much a part of the culture as throwing on the wheel. Another interesting community related thought is how fortunate I am to have met so many of my customers. In the past few years I've sold a good number of pieces to strangers over the internet. With some exceptions, I don't have much interaction with online customers. But meeting people face to face, hearing about what they'll do with my pottery, and how happy it will make them (or their gift recipient) is as rewarding as the money they spend. And I've also made some new friends in the process. And finally, from an artistic standpoint, this season has been especially valuable for the inspiration, encouragement and critical feedback I've gained. Now I can't wait to get back into the studio in 2012.